The expected reforms in the pension system will increase the amount of choices for pension participants in the Netherlands in the near future. When people have more (complex) financial choices, the risk of inertia and making suboptimal choices increases. 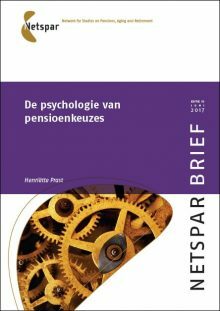 In this 10th Netspar Brief, researcher Henriëtte Prast (TiU) finds that the behavior of people when it comes to financial choices, systematically differs from what the rational model supposes. Especially with complex choices, people react intuitively, rather than rationally. The feeling provoked by language – especially metaphors – plays a major role in the choice that people eventually make. Financial education, based on factually correct and comprehensible information, is therefore hardly effective. In addition to the way of communicating, this research also confirms the effect of the default option for, for example, the self employed. The results show that people in general have the intention to build a good pension. But in practice, saving is postponed systematically. When saving as a “silent choice” is offered, few people will opt-out. This is therefore one of the possible solutions for building a better retirement for more people. Download the summary of the Netspar Brief in English.